I arrived at OSP Wednesday evening as it was beginning to cool off a little. Skies were clear with a couple of wispy clouds and just a little smoky haze around the horizons. There were a lot of people there; it looked almost as crowded as last year when I arrived on Thursday. The sky proceeded to darken; I did a casual count from 9:20-10:00pm and came up with 17 Perseids and 4 sporadics. That's a good rate for that early in the evening. I walked around the telescope field; it seemed that little telescopic observing was going on yet. At 11:00, I started counting meteors in earnest. The Perseids were really hopping; 79 in the first hour was more than I expected. Bob M and Dareth dropped by, and we compared meteor magnitude estimates. Most of the meteors were faint, but there were a few nice ones brighter than 0. My limiting magnitude for the first hour was 6.9. A few high, thin clouds became apparent, and kept the skies from being excellent, but had little effect on meteor observing. My limiting magnitude through the beginning of morning twilight was 6.8. My Perseid rate for the second hour climbed to 94. I took a short break; my third hour began at 1:08am and featured 115 Perseids. Other meteors were apparent; my counts of non-Perseids for the first 3 hours were 16, 17 and 20. Around 2:00am, rates seemed to pick up a bit more. This was reflected in my count for the fourth hour, which I began at 2:22am. I got 127 Perseids and 23 non-Perseids. This pretty much continued into twilight; my fifth and last hour ended at 4:34 and contained 123 Perseids and 26 non-Perseids. This was the best meteor display I've seen since the 2001 Leonids (OK, still just a shadow of that monster show), and the best Perseid numbers I've seen outside of the 1994 outburst year which I also observed at OSP. That year, I got a peak rate of 179 Perseids, but for a couple of hours around the peak the number of bright meteors soared and made the display even more impressive. In general, there were few bright Perseids this year. Thursday featured the thickening of those thin clouds. It was really, really hot as well. In the evening it cleared out a bit. I tried a sketch of comet C/2003 K4 (LINEAR), but got clouded up 9 minutes in. Higher in the sky, it was good enough that I could catch an occasional glimpse of IC 4617 (the little galaxy between M13 and the bigger little galaxy NGC 6207) looking like a fuzzy companion to the very faint adjacent star. This was in the 10" Dob at 230x. I soon gave up as a larger cloud mass moved in, and set my alarm for 12:30am. I woke up a bit before that, and as I was getting my bearings I could see that the sky was mostly clear. There was a bit of haze around stars to the south and east, though. I watched Perseids for 2 more hours. Average LM was again 6.8, but a couple of counts in Cepheus and Andromeda exceeded 7.0. Perseid activity was still nice, but way down from the peak. I saw a total of 73 Perseids and 31 non-Perseids over 2 hours ending at 2:42am. I salvaged the rest of the night for deep-sky observing. A couple of my faint, interesting targets were nebulae in Cepheus. 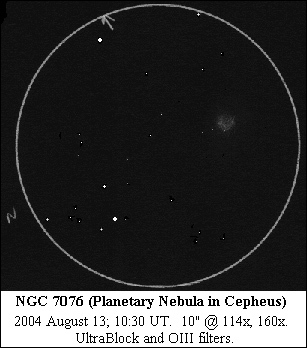 NGC 7076 is a faint guy that looked a bit intimidating on paper. The worst thing about it is the very rich star field. There is a nice C-shaped asterism pointing at the nebula, but less than one low-power field away, there is a similar one pointing the other direction! I got my bearings without too much problem. The nebula looks oval and maybe annular. At 230x with an OIII filter, it takes on more of a half-moon shape with a couple of brighter spots on the edges. The OIII kills the nearby stars, including one right on the edge of the nebula. In contrast, the Orion UltraBlock (a narrowband filter) doesn't enhance the nebula's shape as much but allows some of the faint stars to shine through. The best view is a composite of the two filters. 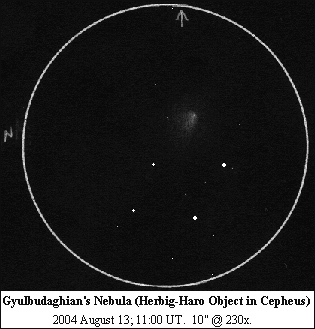 Gyulbudaghian's Nebula in Cepheus also intrigued me, especially after the effort I made to observe the similar McNeil's Nebula last winter. Skyhound had a neat page on this one, but it was a couple of years old so I wasn't sure if the nebula was still bright. It is; I could detect it almost immediately at 230x. It looked oval at first, elongated E-W with an occasional glimpse of a stellar point near the W edge. As I began to sketch, however, fainter nebulosity to the N started filling in a fan shape, and a couple of brighter streaks became visible along the major axis to the E. I tromped around a bit more in the area. The NGC 7129-33 area showed delicate nebulosity. I took a quick look at NGC 2403; the supernova was still at around magnitude 12. The Moon, Venus and Saturn all graced the brightening sky. Then the serious clouds rolled in. *Spo includes 10 Northern Apex and 4 Southern Apex meteors. *Spo includes a total of 1 Northern Apex and 2 Southern Apex meteors. Folks, that was it for the serious nighttime observing. Aside from a few sucker holes and an occasional daytime glimpse of the Sun through Coronado's H-alpha scope display, it was all clouds. An occasional rain shower was welcome during the daytime as it helped to cool things down a bit, but we didn't get the nighttime clearing on either Friday or Saturday. Saturday looked hopeful for a short time, but clouds never really dissipated and the best viewing was of lightning displays far to the south. Maybe next month?